Victorian Prieu Dieu or Prayer Chair. 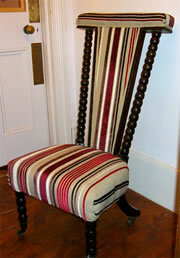 Chair has been upholstered in a contemporary Harlequin fabric and has button details. All upholstery is traditional and hand done.